Iceland is the most active volcanic region on Earth located in the Atlantic ocean between Greenland and Norway. It is a landmass that is part of a much larger entity situated at the junction of two large submarine structures, the Mid-Atlantic ridge and the Greenland-Iceland Faeroes Ridge. Iceland is located where the Asthenospheric flow under the north east Atlantic plate boundary interacts and mixes with a deep seated mantle plume. The buoyancy of the Iceland plume leads to dynamic uplift of the Iceland plateau and high volcanic productivity over the plume produces a thick crust. Iceland is one of the most active volcanic regions on Earth where almost all types of volcanic and geothermal activity can be found. The volcanism on Iceland is the contribution from both the Iceland plume hotspot activity and the Mid Atlantic Ridge activity. The Mid Atlantic Ridge as the name indicates is the ridge forming from volcanism in Atlantic ocean but however it is also visible on land. Iceland's landscapes are forged by the processes of volcanism. The volcanic landscapes include rift valleys, geysers, hot springs, rhyolite mountains, columnar basalt formations, lava fields and lunar like craters. Subglacial volcanism has created table mountains in northern and southern Iceland. Iceland sits spanning the Mid Atlantic Ridge tectonic plate boundary which separates the Eurasian and the North American plates. The ridge, and underwater mountain chain extended about 16,000 km along the north-south axis of the Atlantic ocean. A rift valley running along its spine is formed by plate tectonics and it's the locus of new crust formation. Molten lava from beneath the Earth's crust constantly comes up, cools and is pushed away from the ridge flanks which widen the gap between continents in the process. Iceland formed by the coincidence of the spreading boundary of the North American and Eurasian plate with a hotspot or mantle plume. As the plates moved apart, excessive eruptions of lava constructed volcanoes and filled the rift valleys. Subsequent movement rifted these later lava fields causing long valleys bounded by parallel faults. The divergence of the ridge started in the north about 150 million years ago and 90 million years ago in the south. These movements continue today accompanied by earthquake, reactivation of old volcanoes and creation of new ones. 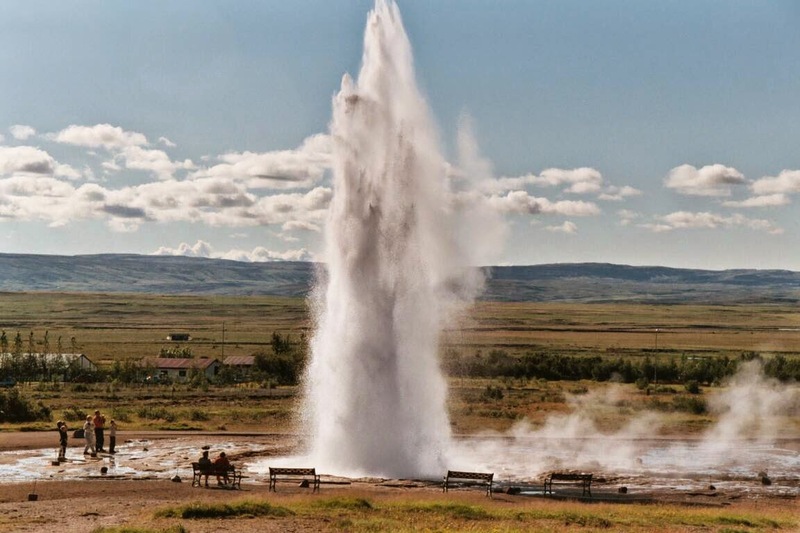 Strokkur is located less than 100 metre away from Geysir and it erupts frequently every 4 to 8 minutes. Strokkur is a fountain geyser. It is one of the very few geysers that erupts regularly spouting steaming water up to 20 meters. Well geysers occur in high temperature geothermal areas within the zone of active rifting and volcanism where temperature in the subsurface sis higher than 200 Celsius at less than 1 km depth. The temperature of the hot springs is up to 100 Celsius and some are constantly boiling. If the temperature at depth rises above boiling, the hot springs erupt which means that they are geysers. Geysers eruption occurs when boiling water within the geyser trapped by cooler water above it explodes forcing its way to the surface. Katla volcano is located near the southern end of Iceland's eastern volcanic zone and is hidden beneath the Myrdalsjökull icecap. Katla is one of Iceland's most active and most dangerous volcanoes, infamous for its large eruptions happening on average every 50-100 year causing devastating glacial floods. Well its been quiet now for a long time but in recent year, increased seismicity and inflation of Katla has been measured. Katla statistically due for a new eruption but an eruption is not too distant would not come as a big surprise. 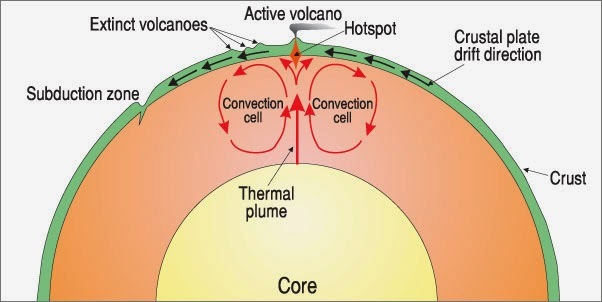 Hotspots or hot spots are region of active volcanism where mantle feeds the hotspot with magma. The magma rise in the hotspot from mantle to crust. It readily meets the crustal plates and as hotspot comprises of hot magma, it starts to melt the above lying crustal rocks. Some areas can be easily accessed by magma as rocks are not hard enough that can bear the hot magma and doesn't rapidly melt and some rocks can be melted easily. Several minerals have high melting point while some have low. This melting point of minerals suggest the rock either to quickly melt or takes time to break the point. When magma start melting so it rises into the crustal rocks. Some places takes little time to break and magma rises to the surface. This is just the case of the Hawaiian islands where static hotspot point is below the islands. The Hawaiian Islands are at the south eastern end of a chain of volcanoes that began to form more than 70 million years ago. 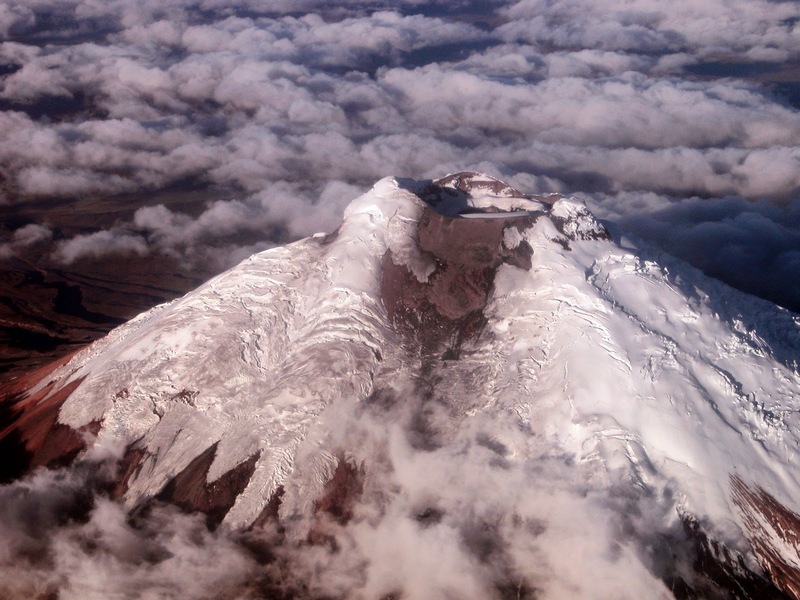 Many of these volcanoes formed islands that have subsided and eroded beneath sea level, and some of the old volcanoes probably never reached sea level. Each Hawaiian island is made of one or more volcanoes, which first erupted on the sea floor and only emerged above the ocean's surface after countless eruptions. As there are series of islands comprises collectively of Hawaiian. All islands are the result from a single static hotspot. The hotspot feeds the surface with lava which starts to build a ridge. The ridge when fed a lot rises above the surface water and form an island. Well how does series of islands have formed with some distance?. This can be understood by plates drifting. Hawaiian islands are on pacific plate that is most active oceanic plate. As a a ridge reaches the surface and makes an island, due to the Pacific plate movement it drifted away from the hotspot. The hotspot magma rise to the surface again by breaking the plate and starting building again an island which was then drifted away so the series of Hawaiian islands formed. 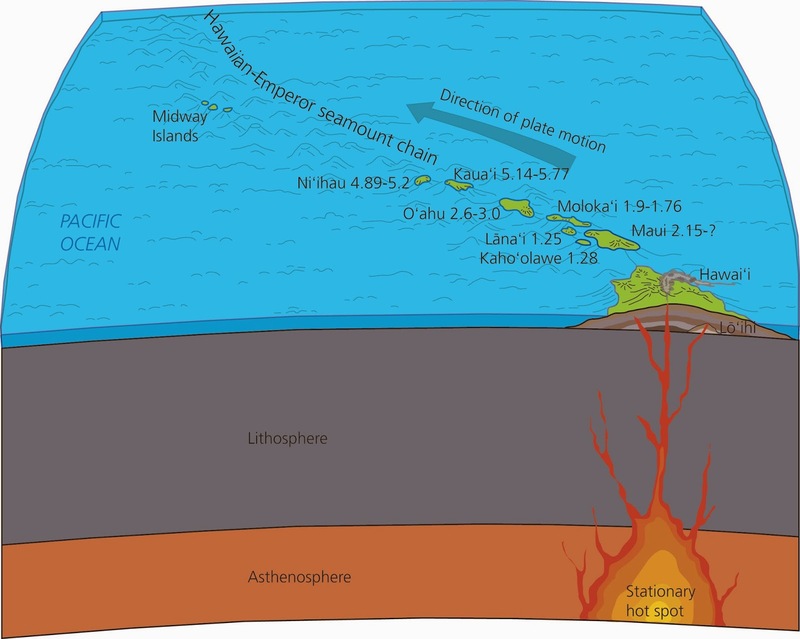 The Hawaiian islands forming hotspot is still active and as of the Pacific plate movement. This will allow the generation of more islands adding to the Hawaiian series. 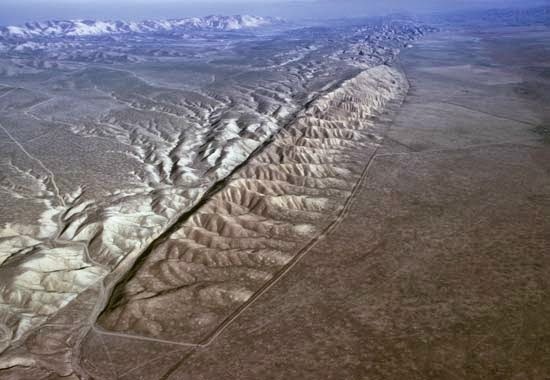 San Andreas fault is a continental transform fault extended over an area approximately 810 miles through California state. It is a right lateral strike slip fault with plate boundary with Pacific plate and North American plate. 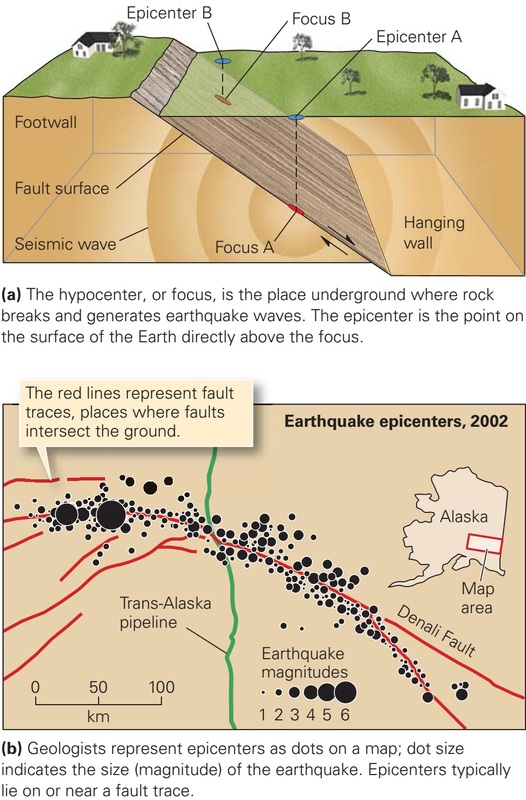 The fault has three segments where each segment has different characteristics and can originate a different degree of earthquake risk. The most significant being the southern part because it passes through 35 miles of Los Angeles. The name San Andreas is from the San Andreas lake which is a small body of water that was formed in a valley between the two plates. 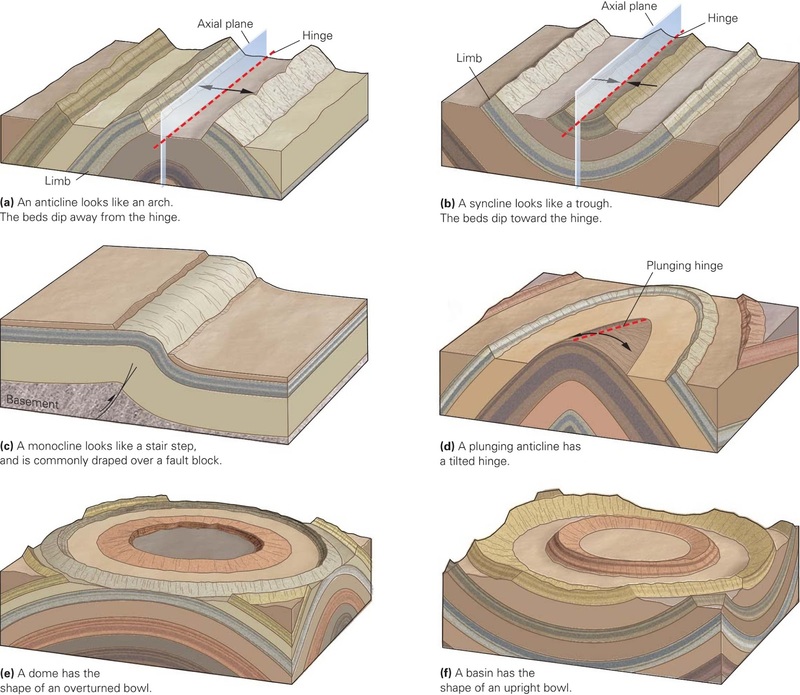 Transform fault is the sliding boundary between two plates. In San Andreas fault there are much of the fractures and faults associated with it which marks the zone where these two plates meet. San Andreas fault is about 28 years old when these plates first interacted. These plates are slowly moving along each other. The two plates are siding with each other at the rate of a couple inches through the year. This rate of movement is spectacular and can develop significant amount of strain with the boundary of the two plates. As shown in the photograph, there are areas which are marked red that is locked down and no movement is along them nowadays and the blue shows the moving area of the fault. As the locked up places does feel the stress but due to stuck plates, no movement is being caused in these areas. But this will never be the same but instead when stress is greater then it can accommodate, one day it will show abrupt movement as was in 1906 earthquake when sudden movement was approximately 21 feet on the areas which were locked. Lets have a look back at the earthquakes generated by the San Andreas fault preserved in the history. The first recorded earthquake from the San Andreas fault is in 1769 then was in December 8. 1812 killing forty persons. Later in January. 1857 which was severe shock then is in October, 1868 killing thirty persons. Then is in March 1872, killed 27 people and on April 19, 1892 Vacaville was damaged. On Christmas day in 1899 six person died because of earthquake from San Andreas. Then the giant earthquake of April 18, 1906 which killed 700 people including total damage of $500 million. Damage of $1 million was done by June 22, 1915 earthquake $200,000 in April 1918. Other are in June 1925 with damage of $8 million, November, 1927 earthquake, March 1933, May 1940 and July 1952. All earthquakes were severe some more and some less damage causing. Of the hundreds of seismogenic (earthquake causing) geologic faultsin California, UCERF (Uniform California Earthquake Rupture Forecast) classifies only six faults as Type A sources, meaning there is sufficient information to both estimate and model the probability of a Magnitude (M) 6.7 or greater earthquake within 30 years. These six faults are the: (1) San Andreas (split into northern and southern sections, (2) San Jacinto, (3) Elsinore, (4) Garlock, (5) Calaveras, and (6) Hayward-Rodgers Creek. Faults which are known to be slipping (and therefore seismogenic) but lack sufficient information to fully model how close they might be to rupture are classified as Type B. About twenty of these faults are estimated to have a 5% or greater chance of an M ≥ 6.7 earthquake within 30 years. 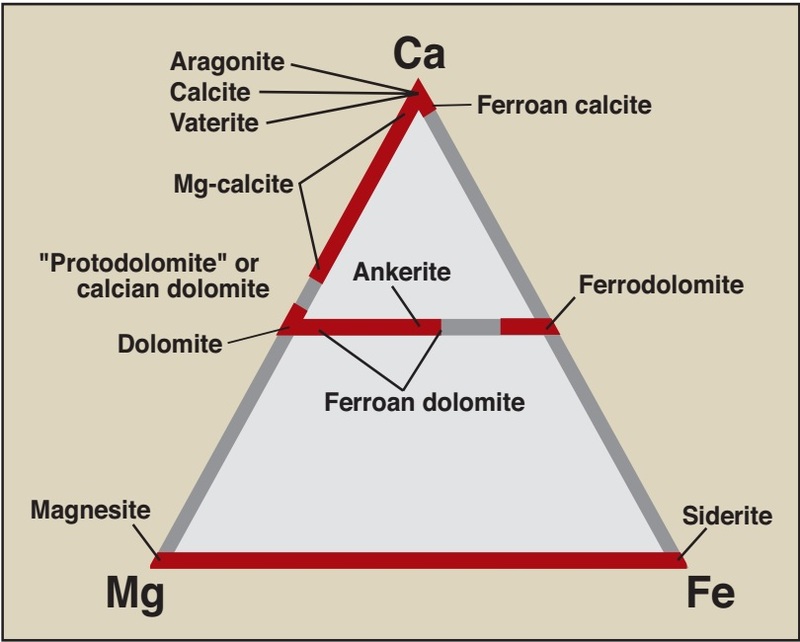 An additional six areas where strain is accumulating but where knowledge is insufficient to apportion slip onto specific faults are classified as Type C sources. There is additional chance of earthquakes on faults that were not modeled, and of lesser earthquakes. Northern California has an estimated 12% chance over the same 30 years of an M ≥ 8 mega thrust earthquake on the Cascadia subduction zone. UCERF has also prepared "participation probability maps" of the chance that any area will experience an earthquake above a certain magnitude from any source in the next 30 years. Indian plate as parted from the Australian plate and moved north towards Eurasian plate 130 million years ago. The Indian plate moved northwards as continents drifts so it collided with Eurasian plate which was already present in the north. From the day of collision the movement of the Indian plate hasn't stopped, slowly and gradually momentum continues. The rate of Indian plate movement is 45 millimetres a year nowadays. 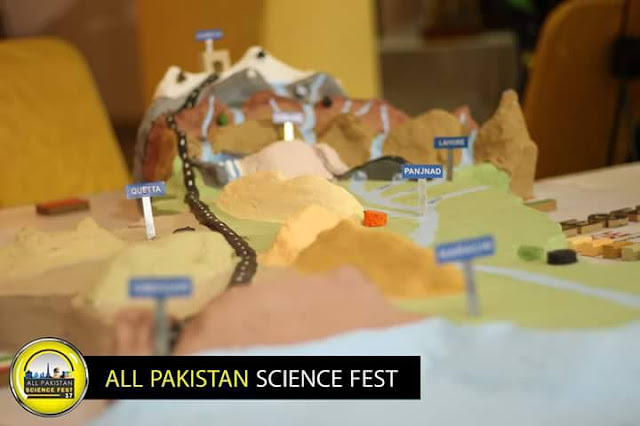 As it is convergent plate boundary which is also termed as destructive plate boundary because of no basinal development but instead are the collision where mountain building takes part. Himalayas ranges are the resulting Eurasian and Indian plate collisions. As the movement continued there are more ranges and thrust faults resulted from it. Indian plate cannot compete with that of a more massive Eurasian plate so lifting will be the result when Indian plate progresses, so it breaks making thrust faults. So what basically is the reason to discuss the Indian plate movement? Well the answer is the faults in the Indian plate as a result of its northwards progression. 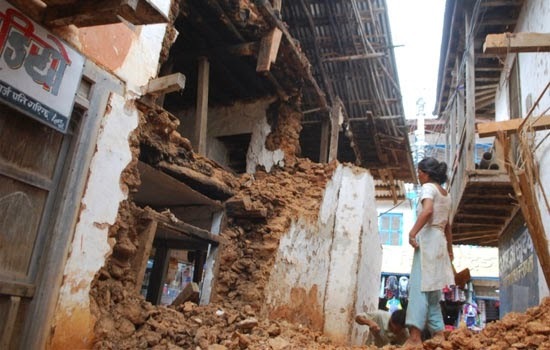 7.8 magnitude earthquake struck Nepal which was devastating. 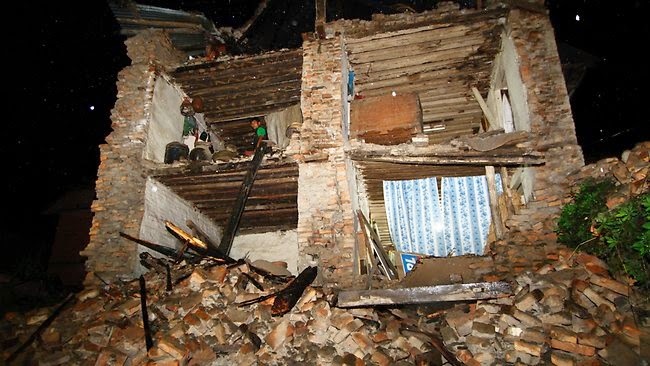 A lot of life were taken because of the ground shaking in Nepal capital Kathmandu.This earthquake was result of the fault line beneath the two plates meeting point, Himalayas. As plates movements are sometime stopped a while because of the plate edges being stuck into one another. The reason for the edges stuck is the brittle rocks which are hard enough not to break but instead stuck. When the plate moves its edges got friction as rocks are stuck, gives a jerk which results in the earthquakes. So this time Nepal is on the hit because of the earthquake caused from the Indian plate movement. Aftershocks are always coming from a major earthquakes, how much more lives are at stake from it? the number up till now is said to be 1500 from the officials but it will still grow as aftershocks continued.